The tone of this poster reflects the anti-Germanisation spirit typical in the 19th century. The lott.. The Moravian Teachers’ Choir was a choral ensemble, whose repertoire ranged from classical to popula.. 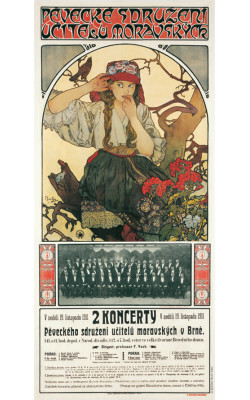 The poster for Princess Hyacinth promotes Ladislav Novák and Oskar Nedbal’s pantomime ballet, starri.. 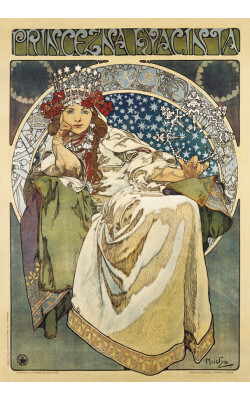 In 1906 Mucha gave a series of lectures at the Chicago Art Institute. 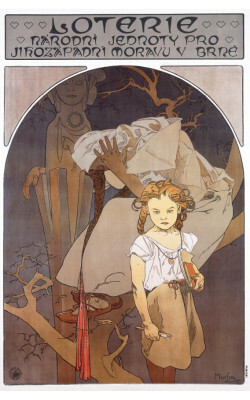 While they were in Chicago, he..
After Mucha's permanent relocation back to his homeland in 1910, Alphonse Mucha returned to his long-held desire to systematically and single-mindedly, through his art, address his fellow people and express their needs and ideals. Gradually a new set of posters emerged, quite distinct in design from the Parisian ones. 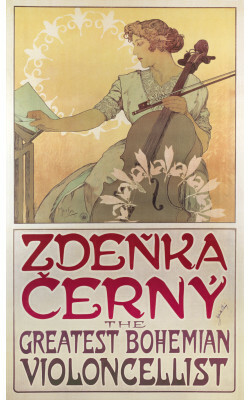 There were two prevalent themes: a new approach to folklore, emphasizing the colourful beauty of Moravian costumes as well as the gentle type of young Slav women (Moravian Teachers’ Choir) and the theme of the sports events and festivals of the Sokol organization, which had been a symbol of Czech national self-determination since the 19th century.